Do you love The Columbia River today with all it's beauty? We do, but have you ever wondered what it may have looked like in previous years. In the photo above, you can see what the Columbia River looked like before The Dalles Dam was built. Read about The Columbia River and how it was used in the 1800's below. During the time period my books are set, the 1870s and 1880s, there was no highway through the Gorge—in fact, there was rugged territory that had to be transversed through the edges of the Cascade Mountains, and some of it could only be accomplished by boat. 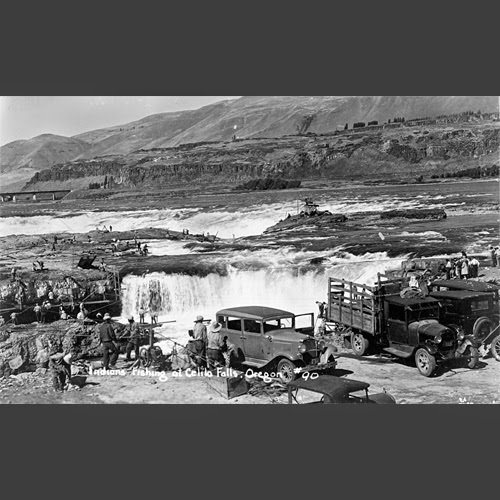 One of the largest hurdles to boat travel during that time period was Celilo Falls, a few miles above The Dalles, Oregon. I was only a few years old when The Dalles Dam was built and Celilo Falls flooded. It wasn’t so much a large dropping fall, as a series of small falls and rapids where the Native Americans had fished for generations. I remember my parents driving up there so my older sister and I could see it before it disappeared for the last time.